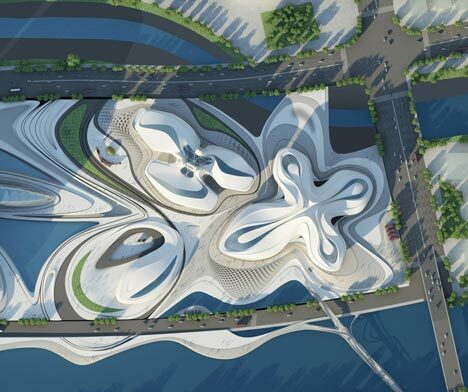 Construction is now underway on a Zaha Hadid-designed cultural complex on the edge of a lake in Changsha, China (+ movie). The project, which broke ground in October, features an 1800-seat theatre, a contemporary art museum and a smaller multi-purpose venue. Each building is planned as a grouping of petal-shaped volumes that curve around one another to create a central plaza and a series of connecting lawns, terraces and pathways. 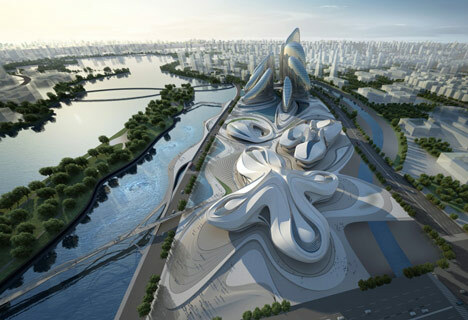 Zaha Hadid Architects won a competition in 2011 to masterplan the site, which sits opposite Festival Island on the edge of Meixi Lake. As part of the project, the architects will add two pedestrian bridges leading over to the island. The Grand Theatre will be the largest of the three buildings and will positioned at the entrance to the site, while the smaller 500-seat venue is to be positioned opposite and will open out to a sunken courtyard lined with shops and restaurants. The museum is planned for the edge of Meixihu Road and will feature a central atrium that separates to form three wings. On one side, the gallery will lead out to an external plaza for use as a sculpture exhibition area or as a temporary event space. 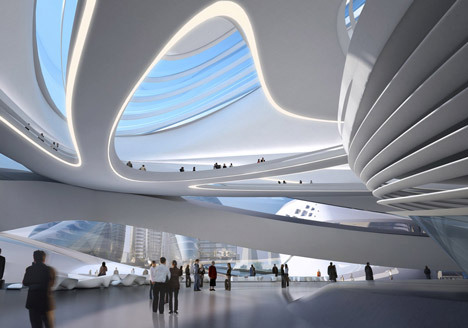 Zaha Hadid Architects has been working on a number of other projects in China. The firm completed the mixed-use Galaxy Soho complex at the end of 2012 and is also racing to complete the Wangjing Soho complex before a rival developer that has pirated the design. 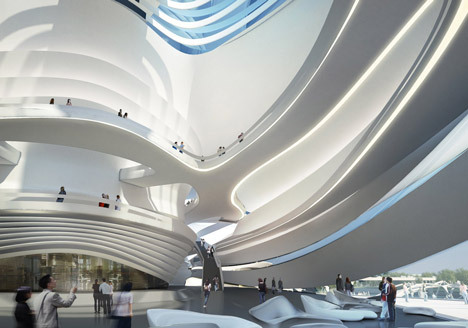 Other recent masterplans by Zaha Hadid Architects include a cluster of towers in Bratislava's city centre and the redevelopment of an old textile factory in Belgrade. 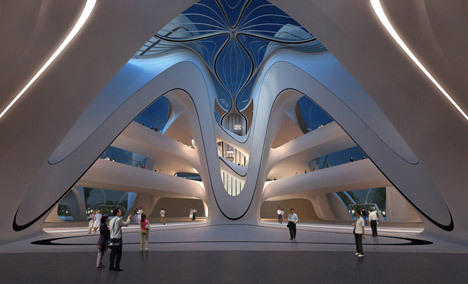 See more architecture and design by Zaha Hadid. Other radical proposals for Changsha include a shape-shifting "transformer building" and plans to construct the world's tallest building. See more architecture in China. 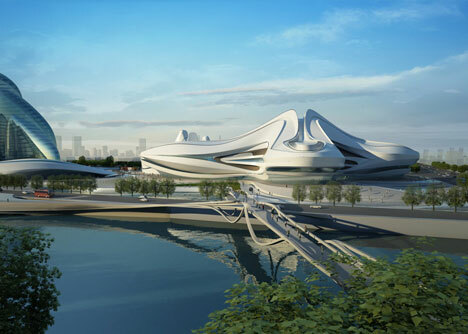 The International Culture & Arts Centre embodies a unique variety of civic nodes and spaces: A Grand Theatre, a Contemporary Art Museum, a Multipurpose Hall and supporting facilities. The central plaza is generated by the relative position of these separate buildings and offers a strong urban experience whereby the flow of pedestrian visitors that come from all sides of the site intersect and meet. In parallel it also stretches outwards to the neighbouring streets with unfettered and phenomenal views across Meixi lake with access towards Festival Island. The Museum's composition of three fluid petals around its internal central atrium, juxtaposes of the various patchworks of gallery spaces in a truly seamless fashion. With outward views and balconies to its exteriors, it aims to engage the site's unique location and surrounding views into some of its gallery spaces. An external plaza which faces Meixi Lake Road allows for outdoor sculptures, exhibitions and events to be extended to an expansive outdoor space. The Small Theatre (Multipurpose Hall) is characterised by its flexibility. With a maximum capacity of 500 seats, it can be adapted and transformed to different configurations. It can therefore accommodate a broad range of functions and shows that span from banquets and commercial events to small plays, fashion shows and music. A commercial attraction, this venue shares seamless public access to retail areas and restaurant facilities, which are seated in an open and gently sunken courtyard linking visitors to and from the basement level. Although these civic institutions are uniquely defined and separate, they supply each other in all respects within its setting with plazas offering visitors a tapestry-like sequence of urban ambiances that relate to the different institutions, inject the site with urban vitality. The working hours of the different venues also overlap to ensure continuity during the full 24 hour cycle; Operated during the evening, the Grand Theatre becomes active as the Museum begins to conclude its day-time operations whilst the Small theatre and retail/restaurants would be commercially available day and night. In this regard, they benefit from each other’s vicinity, ensuring that the site is lively 24 hours a day. This dynamic composition further establishes a powerful relationship with its surroundings, which confers monumentality to the ensemble. 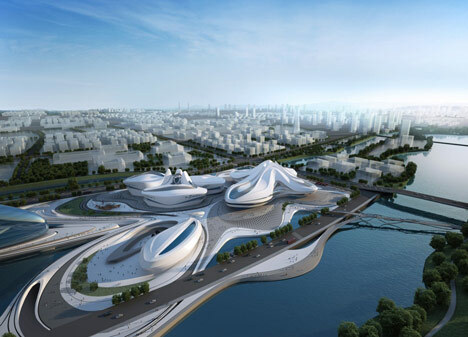 Embodying values of functionality, elegance and innovation, the Changsha Meixi Lake International Culture & Arts Centre aims to become the new cultural and civic node for the city of Changsha, and well as global cultural destination. Find out more about this artist and Artsy.net here!